Buster Keaton stars as a meek and mild projectionist who would like nothing better than to be a private detective. He even dreams about solving crimes. 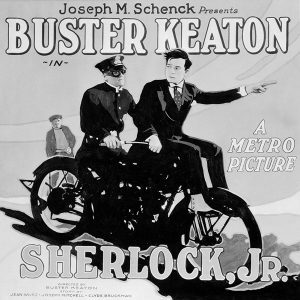 “Sherlock, Jr.” (1924) was the third feature-length film Keaton made as an independent after switching to the longer format following a series of brilliant two-reelers in the early 1920s. “Sherlock, Jr.” is a non-stop collection of gags and stunts with enough innovation and energy for two features. It is one of Keaton’s best-loved films, equally embraced by long-time aficionados and newcomers to silent comedy. A live improvised organ accompaniment to the film is provided by Ben Model. Members $11, public $16.